If you managed to part ways with some of your hard-earned Rands by acquiring a copy of the Business Day this morning, you could have read my column, which you probably thought offered sufficient agricultural rumination for one day. However, I just had to share this wonderful chart (featured image) depicting South African fruit contribution to the global market as it is a welcome feather in our cap. More so, as challenges such as policy uncertainty and climate change remain dark clouds overhead. 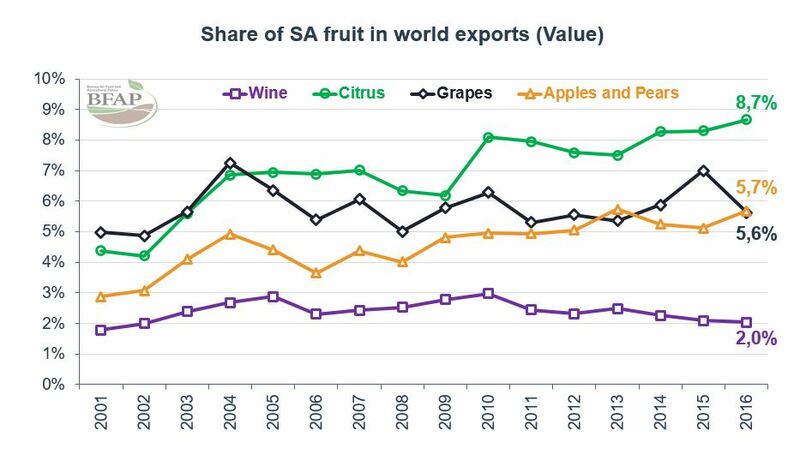 South African citrus now makes up almost 9% of world market share from 4% 16 years ago. SA grapes, as well as apples and pears, account for about 6%. All gaining world market shares. Unfortunately, South African wine global market share declined by a third from its peak in 2010 to 2%. Other countries are growing faster.